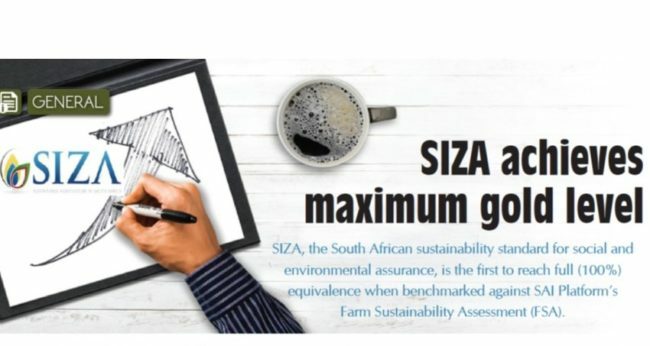 SIZA, the South African sustainability standard for social and environmental assurance, is the first to reach FULL (100%) equivalence when benchmarked against Sustainable Agriculture Initiative (SAI) Platform’s Farm Sustainability Assessment (FSA). The Sustainable Agriculture Initiative (SAI) Platform and SIZA announced the results of an equivalency project aiming to understand the gaps between SIZA and the FSA earlier this year. Founded in 2002, the SAI Platform provides a pre-competitive environment for the food and drinks industry to address global sustainability challenges facing farms today, and in the years ahead; by developing the practice of sustainable agricultural tools and principles that create secure and strong agricultural supply chains, to protect the earth’s resources, along with their network of over 100 members. The SIZA platform offers two separate standards for South African producers, one covering relevant Social criteria and the other covering relevant Environmental criteria. Both standards were thoroughly reviewed against SAI Platform’s Farm Sustainability Assessment 2.0 (FSA) and the result was a maximum GOLD level of equivalence (100% essential, 100% basic and 100% advanced). In 2016, as part of the longer term SIZA vision to include environmental stewardship as an integral offering within sustainability, SIZA partnered with WWF-SA (the World Wide Fund for Nature, South Africa) to develop a comprehensive Environmental Standard, and appropriate tools to support improvement of environmental risk management. WWF’s role was to ensure the relevance and credibility of the environmental criteria within the standard, and they remain involved both at a technical advisory role in the implementation of the environmental module, as well as within the governance structure of SIZA. The results of this benchmark exercise can be viewed on line from the following link: www.fsatool.com: ‘benchmark results and planning’. SIZA is a membership based programme designed to assist growers with ethical labour and environmental practice standards whilst minimizing costs by reducing the number of audits required for market assurance. To date there are nearly 1800 registered members on the SIZA Platform.